Originally published in 1993, Worlds Ago is not only about the politics of the times, but also about the world into which Walter Laqueur was born and raised and the world that shaped him: pre-war Germany in 1921, where he witnessed the rise of the Nazi party. It is a story of families, friendships, and early love; achievements and disappointments; and facing and surviving dangerous circumstances in which many of those close to him lost their lives. 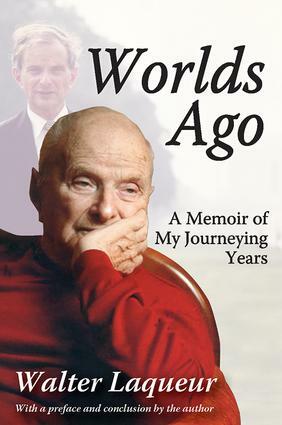 It was a world where calm seas and waters were rare and survivors were lucky to escape the engines of war.This memoir further recounts his experience as an agricultural laborer on a kibbutz, in what was Palestine at the time, living among Bedouin and Arab herdsmen, sharing their labor and lifestyle. Laqueur became a journalist and writer in his twenties, and witnessed dramatic events in the Middle East and the emergence of Israel in the aftermath of World War II. He came to know many of the leading figures on both sides who were involved in the establishment of the State of Israel. Walter Laqueur went on to become one of the leading historians and interpreters of the Weimar period in Germany. This new edition, revised to tell his story up until 1948, also includes a new preface and conclusion.